Steve made learning to drive enjoyable and really comfortable. Failed my first attempt but with Steve's constructive criticism and positives only a few weeks later I passed with only 3 minors. Definitely will recommend to anyone! Thanks Steve and Ignition. Ignition Driving School helped me out a lot. They helped me get my goal - to pass my driving test / theory. My driving instructor Dennis was a big help. He helped me learn to drive and I would like to thank him. I found Paul to be a very competent, patient and professional teacher. He has a calm manner which really helped as learning to drive can be stressful. Straight away, I found myself enjoying driving and could see myself improving every lesson. No time was wasted during my lessons, Paul was always punctual and flexible with lesson times and accommodating my needs. I thoroughly enjoyed learning to drive with Paul and would recommend him to anyone wanting to learn to drive. My lessons with Paul Gowlett were very enjoyable and he made me feel very comfortable when driving. He was very helpful, pointed out where I was going wrong and encouraging me to improve. I would advise him to anyone I knew who was wanting to take driving lessons. I began learning with Ignition Driving School in February 2011. My instructor, Kelly, was a great teacher! I felt confident and comfortable behind the wheel from the first lesson with her. Kelly always answered my questions and was flexible with lesson days and times. She was a lovely person as well as an overall excellent instructor. I'd definitely recommend Ignition Driving School to people I know, especially Kelly. I passed my theroy and practical tests first time within 11 weeks of learning. I'll definitely be returning to Ignition Driving School for my Pass Plus course. Although I was nervous before I started my lessons, I soon felt very comfortable driving. Mark was a great teacher, and was always helpful and supportive. I am glad I chose Ignition Driving School and would definitely recommend it to others. I particularly thought that the pictures of manoeuvre were good. I have been with other instructors before but I would not have passed my test it was not for Ryan. I am a nervous driver but Ryan made me feel so relaxed and calm which helped a lot. Paul was fun, helpful and friendly, with memorable methods of teaching clutch control (a jam sponge cake metaphor) which all added together to lead to me passing first time! THANK YOU! I don't think there is anything that needs to be changed about the way Ignition run their school. I had Jim as my instructor and he was the most friendliest, welcoming person ever! I really enjoyed taking lessons with Ignition. So thank you. Paul was a really good instructor. He was patient and helped to build my confidence quickly. He gave pointers which not only helped me pass my practical test but also would help in every day driving. For anyone wanting lessons in the Leamington / Kenilworth / Warwick area I recommen Paul's service as an instructor. The driving lessons I received at Ignition has been of very high quality. I admit it, I am a slow learner but my instructor Paul was very supportive, he recognised my weaknesses and strengths, which helped me to become a calm and competent driver. With my experience I have already recommended a friend. I was a passenger of a motorway RTA, in which the driver died. I was getting flashbacks when confronted by articulated lorries and was put off learning to drive for many years. However, having spent many years waiting for taxis, buses and for people to pick me up, I decided to take the plunge and learn to drive. I emailed many companies telling them about my plight and only ONE replied, Ignition. I was then introduced to my driving instructor Mr Steve Perry and even after I told him what I went through he agreed to teach me. Although progress was slow (due to the fact I was happy to just drive on back roads), Steve spent many lessons reassuring me that the car has dual controls and that nothing was going to happen to me or the car. Even when I made mistakes Steve made me feel at ease and relaxed. Steve was very patient and encouraged me to believe in myself. Steve made me see sense and after many lessons I was ready to take my test. On January 27th, I took my driving test and to my amazement I passed with just 3 minors. I have recently been doing the Pass Plus which I have really enjoyed, as it has helped me to have a better understanding of the different situations that I as a driver could be confronted with. I would like to take this opportunity to thank Steve and Ignition and I would recommend anyone who is thinking about learning to drive to give you a call. Learning to drive with Ignition allowed me to look forward to and enjoy my driving lessons whilst gaining invaluable experience and becoming a competent driver. My instructor, Paul Gowlett, was friendly and talkative with me and was also a very good teacher. Helping me to feel calm and confident with clear instructions and encouragement to make me improve. From my first lesson with Paul, I knew I was in good hands. 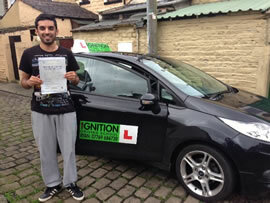 His in depth practical teaching style really made learning to drive an enjoyable and rewarding experience. His different ways of making you remember certain things really helped bridge the gap between one lesson and another. I would recommend Paul to any learner driver and would like to thank him for making me feel comfortable and teaching me everything that I needed to know after passing. I thoroughly enjoyed learning to drive with Ignition Driving School. A large part of this was due to my kind and patient instructor, Steve Lightfoot. Always friendly and relaxed yet professional at the same time, I couldn't have asked for a better instructor. I would definitely recommend Steve to anyone wishing to learn to drive; I wouldn't have done so well and passed without all his hard work and patience! My teacher, Sandra, was great! She was really friendly and every lesson was well structured. The value for money of the lessons was really good too! Steve was a great teacher and very patient. Thank you. I have thoroughly enjoyed the experience of learning to drive. At first I was extremely nervous, but my nerves disappeared after my first lesson was over as Dan was extremely patient with me and kind. I would definitely recommend Ignition Driving School. Overall the whole experience from my first lesson to driving test was great! Having had driving lessons with a different instructor and failing three times, I never thought I would be able to pass my practical driving test. However, I moved to Ignition Driving School, ad under the expert tuition of Ryan Meachin both my confidence and ability increased in a very short space of time. Ryan is a brilliant instructor who is very friendly and professional. I passed my test first time with Ignition Driving School! Steve is a great instructor, gave great pointers, is a funny person and great support. Thanks to Steve I've passed my driving test! We would (& have) recommend Kelly & Ignition Driving School to friends. Kelly's teaching ability is excellent, she is calm, methodical without being slow or boring, a good communicator and safe. She is very well respected at the test centre. In dealing with young people Kelly was understanding, approachable & flexible - teenagers can be tricky!! Kelly seems to handle them very well. Thank you very much Kelly. Sandra was very friendly, easy to talk to. When I got nervous or started to panic she would just tell me to calm down and not dwell on it if I made a mistake. Thank you Sandra for helping me to pass my test!! Steve, He was an excellent instructor and made me feel at ease / confident. I would highly recommend him. I was looking for a female instructor and found Kelly...I had an exceptional experience learning to drive with her. She is a real good instructor who knows how to deliver the lessons which can be easily comprehended by pupil...She keeps on notifying mistakes during the lesson and debrief overall progress in the end of every lesson which really helps in understanding and rectifying the mistakes. She was very flexible with lesson timings and always accommodate me whenever possible. She is encouraging as an instructor and chatty and nice in person. I had a wonderful experience with her. Although I only had about 12 hours worth of lessons (due to my dad teaching me the basics for a few months before) I found learning and preparing for my test with Paul invaluable. He was always prompt, never cut the lesson short and patient. I found his folder used to explain situations / the manoeuvres very helpful and it was obvious he was experienced at teaching - would definitely recommend to friends. I would highly recomend Steve as a driving instructor. Each lesson was an enjoyable experience and made me feel at ease. He had a lot of patience and I have also recommended him to many of my friends. Learning with Ignition was great, I wanted to get my licence quickly before the summer and my instructor was more than happy to help by giving me the hours I needed to pass 1st time! When I first started learning I was very apprehensive and nervous, but Jim was an absolute star! Straight away I felt at ease, which really helped me to learn. Jim was friendly and funny, and made my lessons truly enjoyable, so much so that I looked forward to my next lessons. He stuck by me through 6 tests! Helping boost my confidence and improving my skills. I couldn't have done it without him! Thank you. Dennis was a great instructor, he made me feel at ease and stress free during my lessons. I will definitely be recommending him to my friends and I'm very thankful of all his help. I was a very nervous driver when I started learning, and Paul was very encouraging and patient. I always came away from my lessons feeling more confident. I have now passed my test a 'safe and sound' driver, according to the examiner and I can't wait to get a car. I really began to ENJOY driving - a huge step froward for me. I had tried another, but was recommended Ignition by someone I worked with. I was very impressed with the professionalism of the instruction, and would recommend this school for any of you with a nervous disposition and the instruction was excellent. Kelly was very clear at ensuring I had a "method" of doing everything which I found hard. It was this level of help which allowed me to succeed. I was recommended Ignition by a friend and was not disappointed. Paul was great from start to end. He was friendly and always helpful, I always enjoyed our lessons - was a great experience. Thank you! I was a very nervous learner, and at 34 had probably left it later than most people to start! Kelly was excellent - calm, kind and I had total faith in her. Passing has changed my life. I have independence, and my confidence has improved hugely. I thoroughly enjoyed my driving experience with Steve. He made me feel relaxed and at ease from my first lesson. Learning to drive with Steve was a pleasure. He gave me confidence and his teaching techniques were fantastic. He is friendly, honest and a great instructor. I have learnt to drive with several other companies but Ignition beat all experiences by far. I will 100% be recommending this company and Steve as an instructor. I was extremly pleased with the service I received from Paul Gowlett as an instructor. Paul was very helpful, patient and a joy to be taught by! He is an asset to Ignition! I would have no hesitations in recommending Paul to anyone. I was totally inexperienced when I had my first lesson with Dennis. He went through all the lesson breakdowns and what we'd be doing each week. He made the lesson easy to understand and worked at a pace that suited me. Overall, Dennis and the team at Ignition have made my driving experience enjoyable. Excellent learning experience, not rushed but made significant progress each week. Paul was the best driving instructor I could have asked for. He was patient, friendly and always knew how to improve my driving. Without Paul I do not think I would have passed as quickly as I did. He was never late and knew how to make me drive to best of my ability. Ignition is a brilliant driving school and I am so thankful for all of Paul's help. I highly recommend learning to drive with Ignition. I learned with Mr Paul Gowlett. He was an excellent teacher. He put a nervous learner at ease straight away. He was able to give me lessons to fit around my unusual schedule. He was always on time and lessons always lasted exactly the correct time. With lessons from Paul I was able to pass first time with only 2 minors. Paul is full of excellent advice and became more like a friend instead of an instructor. Thank you to Kelly who put up with my initial contact and was able to put me in contact with Paul. Steve was a very friendly and helpful instructor. My time with him was never a chore and always constructive and informative. Milly was amazing. Would recommend to anyone. She made me feel at ease and made lessons fun. She was very patient with me and gave me very clear instructions on how to improve. Always on time for lessons and very flexible with my busy work schedule. Passed first time with only 2 minors. Thanks Milly!! Paul has been an excellent instructor, from calming my nerves on my first lesson to a smile and "good luck" on the day of my test, it all added up to an enjoyable experience. I've had more than one driving instructor and I'd have to say Paul was the best. As well as being a good instructor, he brought his personality to work with him and it was good to get on with him and have a chat at the same time as learning. Cheers for all your help, i'd recommend you to anyone! After a total of 20-30 lessons with two other driving schools, I found Ignition who appointed Sandra as my instructor. I am very pleased they did as she was brilliant with the way she teaches and finally after 4 months I passed first time. Colin was accomodating and confidence inspiring throughout every lesson. He allowed me to take charge of my learning as he supported my improvement in areas where my confidence was weakest. Truly exceptional instructor who I would recommend to any learner at any stage - Colin will not let you down. Ignition had fantastic customer service. I found myself a few weeks from my test with no instructor. In less than a week I was back on the road thanks to the Ignition team. I enjoyed learning to drive with Ignition and felt very comfortable in the car I was learning in. The car was always clean and in good condition. My instructor was always on time and had very good punctuality. I was very pleased with Ignition Driving School. My first lesson with Jim made me feel very comfortable after having been rather apprehensive of starting to learn. He helped me to relax by giving me clear instructions without putting too much pressure on me, while at the same time encouraging me to progress and grow in confidence. I am very thankful to Jim for helping me to pass my test 1st time and would definitely recommend Ignition Driving School to a friend. My experience at Ignition Driving School was incredible. I am very pleased that I chose this driving school. My driving instructor Steve in particular has helped me a lot throughout my experience of learning to drive. He was very patient, friendly and explained everything carefully to ensure that I understood. If I didn't he would go over it until I was confident with it. Steve would always put me at ease whilst taking me on different types of roads and routes which I found very helpful as I was able to get used to different types of roads. As a teacher myself, I'm often quite critical of people who teach me, but I was delighted with Mark's tuition. Lessons were thoroughly enjoyable, with a perfect blend of humour and learning. I felt well prepared for my test. I would definitely recommend Mark to others. Thank you very much! Ignition Driving School, in my experience, provided quality driving tuition which helped me to pass my test first time with no previous experience. My instructor Paul was thorough and concise throughout, and I wouldn't hesitate to recommend him. Thank you Ignition! Easy to contact instructor and friendly, understanding manner to situations e.g. for cancellations or changing lessons. Vey leniant and adaptable. I chose to do hourly lessons after being recommended by a friend. I took my first lesson a few days after my 17th birthday and immideatly felt at ease with my instructor. The lessons were great value for money and my instructor was really helpful and firendly. I was desperate to pass my test first time and Paul Gowlett made sure that would happen! I was very happy with his instruction - he really helped me to perform all my driving manoeuvres in a way that would help me to pass my test and in a way which worked for me personally. A very helpful and friendly instructor! Ignition was so friendly to book and I was a nervous pupil, Sandra Jones, the instructor made me feel so much better, we had a laugh at times. Would just like to say a big thank you to Steve! All credit goes to him, really helpful and informative lessons! Was fun as well as useful. Steve was a very professional and friendly instructor. He always gave me helpful feedback on my progress and without him i doubt i would have had the confidence to go ahead with booking my test. I'm glad i did as i passed first time with Steve's patience and encouragement. I am very happy with my experience with Ignition Driving School. I was incredibly nervous when I started learning to drive, but Kelly was really patient and great at putting my nerves at rest. Always very supportive. Being a stay at home parent, I was quite restricted in when I could take my lessons, but Kelly was great at always being able to fit me in when it suited me. I would recommend Ignition to anyone learning to drive and think the high level of teaching is fantastic value for money. Being able to drive has changed mine and my son's lifestyle. So many, many thanks! I always felt comfortable during my lessons. Kelly was always on time and gave me plenty of notice when she had a reschedule anything. I would recommend Ignition Driving School to anyone wanting to learn to drive. Ignition Driving School is fab. I was put right at ease and never looked low cost but high standard. Past my test 1st time with only 3 minors. Thank you for giving me my freedom! The lessons were great, the instructors were friendly and I finally passed! Great stuff. I was very apprehensive before my first driving lesson and I neednÂ´t have been. Paul gave me all the confidence I needed to enjoy my first lesson and all those afterwards. He was always calm and encouraging and explained things in a very understandable way. Paul made lessons informative and relaxing. He was very supportive and helpful. I really enjoyed learning to drive and with Paul's expert help passed in 3 months. Before I came to Ignition I was not very confident and I had very poor road awareness. But thanks to Paul Gowlett and Ignition I managed to pass my test first time with just 2 minors. I would truly recommend this company to anyone. Brilliant driving school and value for money. Learn to drive with your company is good value for money. As for your instructor, Steve's teaching is outstanding, friendly, honest. Ignition should be proud of having a teacher like him. I really enjoyed my driving lessons with Mark. He was really patient with me and acknowledged my weaknesses so that I could practice them to learn in as short a time as possible. Mark was very encouraging and flexible when it came to fitting lessons in around my education. I would highly recommend him. I'm so grateful to Sandra without her it would not have possible for me to pass my practical test. The ideal instructor for anyone wanting to learn how to drive, very flexible, friendly and cooperative. The price is reasonable comparing to other driving schools. 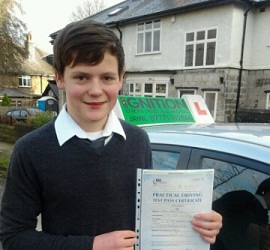 As an ex-pupil of the Ignition Driving School my experiences with Kelly my driving instructor were most enjoyable, from my very first lesson right through to my driving test I was dealt with the upmost respect. Kelly made me feel at ease and explained everything to me so I understood what I needed to know, nothing was too much trouble even when I asked more than once (which was quite often). I was recommended to Ignition from a friend who had the same experiences as I had, they also passed their driving test first time the same as me. Also two other friends passed first time with Ignition so I felt their pass rate was excellent and that's what made me choose this particular driving school, along with the fact that they said the instructor was very easy to understand and get on with. They gave me all the info I needed for my theory and once I passed that we moved on to my driving test and it was all at my pace which was great. I would highly recommend Ignition Driving School to anyone and have done in the past and the future to family and friends and they all agree they are a very good driving school, so go on give them a go and throw away those L plates and start cursing like me. I started learning with Paul Gowlett at the end of November 2012. I had 2 x 1.5 hour lessons each week and even with the unfavourable weather conditions, I passed mid-February 2013, first time. Paul was a superb instructor and I would happily recommend him to learner drivers. Every lesson, I received my money's worth and he did a cracking job at preparing me for my big day. All the best, and "up the Red Devils!" Sandra is such a lovely instructor - I was always able to ask questions, and if I did not understand she was happy to explain in a different way so that I understood. Very patient and understanding of nerves. If you are serious about wanting to learn to drive, I would recommend Sandra to anyone. Could not be more happy with my experience. I had an awesome instructor, he helped me to learn and pass my test in just a few months, always friendly and on time. Really excellent value for money and enjoyed my lessons. All the questions I asked about driving and the road was answered Brilliant! Would recommend to anyone. I really enjoyed learning to drive with Sandra, she was very friendly and I feel that she taught me to drive very quickly as I passed first time, in less than one year learning. I also believe the price of the lessons are very good compared to other driving schools. I really enjoyed my driving lessons. Steve took the time to develop my confidence and supported me until the end. I was very impressed with the service and friendliness of my instructor, I have had lessons with other companies and instructors, Mark was by far the best. Many thanks. Paul was a great Instructor, he was always helpful. He was not just an instructor but he was like a friend. Paul is an asset to the Ignition Driving School, although English is not my first language, I was able to understand Paul's instructions clearly. I will recommend Paul and Ignition Driving School to other learners. Paul taught me a couple of years ago where i passed first time and then again recently once I had bought my own car and was in need of some refresher lessons. I was an extremely nervous driver but Paul has a lot of patience and helped to build my confidence throughout. He encouraged me to go on routes that I would usually want to avoid but with his help I am now confident to drive on them. I have been very happy with all the help he has given me and couldn't suggest anything different. Would highly recommend, particuarly for anxious students like myself! Thank you Paul and Ignition! Sandra was a great and friendly instructor. She always did her best to fit lessons in around my working schedule and move others' lessons to suit me as I neared my test. I was really impressed with Ignition, because they do all they can to help you pass not only your driving test but also your theory and the instructors are really friendly and helpful and gave lots of helpful tips on driving, and were always on time and available and flexible with times that I wanted a lesson for. I would recommend Ignition to anyone wanting to learn to drive. Sandra was a lovely driving instructor, very calm which I feel is essential when learning to drive. Very easy to get on with, got on with her very well! I came to Ignition Driving School after previously failing twice with another instructor and so took a break. My instructor, Paul Gowlett, was great. I was nervous and worried and didn't enjoy driving when I started again, but Paul was very calm and confident about my ability and I now really enjoy driving. The lessons were very well suited to my ability and Paul was always asking if there was a specific area I'd like to practise. He was very friendly, punctual and very available for lessons and so I'd certainly recommend him and Ignition Driving School. Thanks Paul! Steve was punctual, friendly and very informative. He gave me space and freedom to learn at my own pace, and I think it worked brilliantly! His guidance and knowledge is highly recommended by myself! After 20 hours with Steve I passed with flying colours! Before I started learning to drive I thought it would be a piece of cake, but I proved myself wrong. I found it tough and I hated to practice manoeuvres over and over again, especially when I got it wrong! Paul Gowlett was my driving instructor and he was excellent. Always very patient but pushed me when I needed it. I want to say a big thank you to Paul, because I don't know where I'd be without my car. I only passed 5 months ago but it seems like a lifetime! Steve was very helpful. He has a very patient and positive manner. I actually enjoyed my lessons, despite thinking I would not. On my first lesson I told my instructor, Mark, that I wanted to learn to drive in quite a short space of time - he really helped me do this, and was flexible and communicative throughout the four months that I had lessons with Ignition. During the lessons themselves, he made me calm and relaxed and learning to drive was enjoyable as well as beneficial. I would definitely recommend both Mark and Ignition Driving School to others. Paul is an excellent instructor. He was also extremely helpful in arranging lessons to suit my very busy schedule (in London at university). In particular, changing his own weekend commitments to help prepare for cancellation appointment. Mark was patient and kind from the beginning; I remember peppering him with questions every two minutes. He answered each of them clearly, using language and examples I could understand - even in my highly nervous state! I made lots of mistakes to begin with, but Mark never made me feel silly - rather he used them as learning points, talking through why it happened so I was less likely to make the mistake again. Mark allowed me to relax behind the wheel; he reminded me that driving can be an enjoyable activity, while still being a safe, careful driver. Steve was a great instructor. He was on-time and made me feel at ease. The whole training was great and he was very patient throughout. I would gladly recommend Steve and Ignition to anyone. Steve Lightfoot was / is a very good instructor who got me up to test standard within a few lessons. He tells you as and when you are in need of improvement and talks you through everything that needs to be done in order to get through your test in good detail. I would highly recommend Steve to anyone wishing to take their test in Lowestoft. After stopping my driving lessons in 1994 to have my son, I found it really hard to get back into driving. My driving instructor had also stopped teaching so this also made it very difficult. After phoning around many different instructors, I then phoned Ignition, and spoke to Kelly. I got a very happy friendly voice, which made me feel relaxed. Lesson times were never going to be easy as getting childcare was a problem and working different hours each week, which meant hours were limited. Kelly always fitted me in for an hour, lessons were great, I was also comfortable. We always had a laugh and a chat. Any problems I could always text Kelly or she could text me. I really enjoyed my lessons and building my confidence towards my test. I look forward and am happy to pass on Ignition Driving School to my friends (especially Kelly) Thanks to Kelly I've passed my test but also made a new friend. I really enjoyed learning with Ignition Driving School, the comfortable environment allowed me to progress at my own pace as well challenge myself with new manoeuvres. It was great - passed first time! I was nervous when I first booked my lesson, but excited as well. Steve straight away made me feel comfortable. Steve was/is a very good instructor and I would recommend him as an instructor and the driving school. There isn't anything I could complain about. From the moment I started my lessons, Kelly was fantastic, even I thought I was doing terrible, Kelly would assure me. Doing an intensive course was the best thing I've ever done and I would highly recommend Ignition to others. Great value and friendl instructor. I started learning when I was 17 with a different instructor, then I changed to Ignition 2 years later. My instructor Steve Perry is a credit to Ignition Driving School, lessons were very enjoyable and managed to pass with only 2 minors. I would recommend Steve for any one else learning to drive, and have already passed on two friends to him. Ps. Need more instructors like Steve. My driving instructor Dennis was brilliant. He was always punctual, extremely effective in his instruction and was flexible regarding the lesson structure and timing. I felt engaged and he brought me forward leaps and bounds until I passed my test. My instructor Steve Perry was great, really made me feel at ease while driving and gave informative answers to any questions I had. Overall, a great driving experience! After 4 years away from driving, Colin immediately made me feel relaxed and capable. He has a calm, reassuring manner and has a way of constructively telling you where you're going wrong without making you feel inept. His jokes always lightened the mood and put me at ease, particularly when I was having an off day (although, he'd never say if I were). I passed first time, and within 2 months (and less than 10 hours) of starting my lessons here. This is in no small part due to Colin, who is worth absolutely every penny that he is paid. Thank you! Steve was my 3rd instructor and by far the best, always very helpful and gave me the confidence I needed to finally pass after 3 attempts, I recommended Steve to my friend who also passed recently. Absolutely fantastic instructor and highly recommended. While learning to drive, I found my instructor very helpful patient and kind. I felt he taught me appropriately and helped me when I found things difficult. I felt that whilst learning, things were taught to me well and there was nothing I could have done differently, I will be recommending Ignition to anybody who I know that is about to learn to drive. My lessons with Ryan were very enjoyable. All my lessons were also done at my own learning pace and he was very patient with me. I would definitely recommend Ignition Driving School to anybody wanting to learn to drive. Brilliant instructor! Finally passed after several attempts and several driving instructors. Dennis was the push I needed. Would definitely recommend. I was extremely apprehensive before taking my lessons and I found Paul Gowlett, my instructor supportive, encouraging and generally in tune with my abilities; strengths; weaknesses; confidence, in a way which was perfect to enable me to become a safe driver. I had a fantastic experience in my driving lessons despite being very nervous prior to my first one. Paul was great and makes you feel really confident, I would recommend him to anyone. Lessons were affordable and always on time. A massive thank you to Paul for his help. 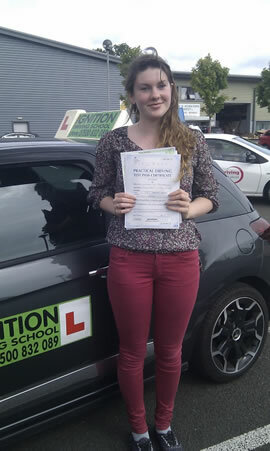 I found my lessons with Kelly very enjoyable and don't think I would have passed first time if it wasn't for her. I was very apprehensive before starting lessons with Ignition as I had lessons elsewhere and was very put off with driving but decided to give it one last try as I knew driving is a life skill. She showed me techniques to make it a lot more simpler that I never knew before and built up my confidence a lot behind the wheel. Kelly is extremely helpful, pleasant and friendly. I'll miss our weekly gossips we used to have! The tuition was excellent, I can not think of a single thing that could have been done better or differently. My friend has not started learning to drive yet and I will definitely recommend her to Kelly and I'm sure she'll enjoy it as much as me!. I had very little confidence when I first started my driving lessons. I couldn't imagine myself ever being ready to take the test, let alone actually pass it! But Jim was a brilliant instructor, he was really friendly and explained everything so clearly. I actually began to enjoy my lessons, which was amazing as I had been dreading learning to drive, and put it off for years. I am so pleased with my achievement and would recommend Ignition to anyone. I will miss my Wednesday morning lessons and my chats with Jim. My driving instructor was very nice and friendly. He was also a great instructor and was a great teacher. I found Paul Gowlett a really nice and friendly instructor, he settled my nerves with a great sense of humour, especially when laughing at me for saying sorry all the time for my mistakes! He was very constructive in his criticism whilst giving me very clear and precise instructions. My confidence grew and grew with the more lessons I had. On the morning of my test, he put my mind at ease. The result of this was a test with only two minors, and I will be eternally grateful of Paul for this. I took driving lessons from Ignition as my international licence was about to expire. I found my driving instructor Steve was a very relaxed, considerate and chilled out person. He patiently corrected my mistakes and was never overly critical. He also was quite friendly which made me very relaxed for my test. I passed my practical test with just 4 minors on the first attempt and I must really thnak Steve for his inspiring approach. I would highly recommend Steve to anyone who is looking for lessons around Lowestoft. Thanks Steve and Ignition. Steve was a great driving instructor. Only having a relatively short time to learn before my test, I was unsure as to whether or not I would pass. Thankfully the learning process gave me the confidence and skills required to pass whilst never feeling stressful thanks to Steve's unique sense of humour! I would definitely recommend Ignition and Steve in particular to anybody learning to drive. Fantastic experience with Steve. Great instructor and very helpful. I am more than happy with the standard of teaching I got at Ignition Driving School. It took me a year to be ready and I passed second time around. I didn't have much time for lessons as my baby was 6 months when I started and my instructor was very patient and positive all the way. I asked for a female instructor and I think I was more comfortable that way. It is nice to have the choice. I would recommend the school to friends. I would advise people to drive twice a week if they can, I think the more the better. I had such an amazing experience learning to drive with Ignition and my driving instructor was so friendly and understanding. I was able to form a great bond with her and she made me feel at ease with the car. I was able to pass my test with no minors!!! 5 Star Rating! I was really happy that I chose Ignition Driving School. I started off with Swindon Driving Academy and thought it was so boring and hated my instructor. Sandra really made it as enjoyable as possible and got me passed. I play for Swindon youth team and as next season I will be a second year apprentice I will definitely recommend Ignition Driving School. There are 3 of us in the team that have used you and passed now so I'm very thankful for what you and Sandra have done for us. I was very nervous to start driving lessons as I had never driven before, but Ignition (especially Sandra!) gave me the confidence to be able to pass first time! I would recommend Ignition to anyone wanting to have affordable and fun driving lessons. I had a fantastic experience of learning to drive with my instructor Paul. Although I was not a natural at driving, Paul's patience, professionalism and encouragement helped me to improve immeasurably and enjoy the process. Paul's thorough approach to learning meant that I am confident in all areas of driving and wasnÂ´t just taught to test level standard. As a student I found Paul's flexibility very helpful for scheduling lessons. I will definitely recommend Ignition to other learners. I had a very positive experience. Thank you. I had a very bad experience with my first instructor, which knocked my confidence. Found Dave through Ignition Driving School. Straight away I felt at ease and very comfortable. Very pleased that I went with Ignition Driving School, also passed my test, and only got one minor. I was thoroughly delighted with Kelly as a driving instructor, always happy and smiling but yet honest with regards to driving and how it was going. She always went out of her way to squeeze more lessons in to enable me to meet the fixed deadline of my driving test... and I passed! I was very happy with my instructor, Dan. He was very friendly and helpful in supporting me and my driving. On the day of my test, I was so nervous but Dan really supported me and put me at ease, by boosting my confidence and telling me "I can do it!". I passed first time!!! I would definitely recommend Ignition Driving School and most definitely recommend learning to drive with Dan. He helped me pass my test in under 2 months. Sandra was helpful in every sense of the word. If I needed any questions answered, she was more than happy to help. I felt comfortable in my lessons and she put my nerves at ease. I thank Paul for making me pass the test on the very first attempt. He made me acquire so many skills in a very short period of time. He was very friendly and his instructions were totally based on my needs than anything else. I have found his instructions very helpful in not only passing the test but also a safe driver for years to come. I'd certainly recommend Paul to those who want to become safe drivers in the shortest time possible. Having had a number of instructors prior to Paul, I had begun to feel a bit despondent. However, Paul's teaching methods helped me gain confidence very quickly & I felt he really tailored lessons to my needs. Paul was able to assess my weaknesses constructively & stop them being a problem. Without his friendly, calm & a good understanding of individuals different learning styles, I do not think I would have passed first test & be the confident driver I am now. My experience with Ignition (Sandra) was very good. She was always very patient and very friendly! I always felt at ease and comfortable while having my lessons, I would highly recommend the driving school, especially Sandra herself. Colin was an excellent instructor with a lot of driving experience. He helped me learn 100 percent to pass my test. Would recommend him to all learners. I am very happy that I chose Ignition Driving School. Previously I used a different driving school and I got an instructor, which wasn't very nice to me. After I started with Ignition Driving School, I got a very very good and nice instructor Sandra! Sandra never let me feel under pressure, she was very helpful all the time and honest with me, which made me feel relaxed during lessons. I will be highly recommending Sandra to any of my friends, which are looking to start driving! Steve from Ignition was incredibly friendly, patient and thorough in his teaching. He made learning to drive an enjoyable experience, helped me to pass first time, and I would recommend him to everyone. Thanks very much Steve! I have found the service offered excellent and would recommend Ignition without hesitation. I found my instructor fantastic. He was always on time, courteous and easy going and I felt very relaxed when I was driving with him. I found the mock test sheets that I was given for the theory and practical side of the tests to be very useful and also the mock practical tests that I did nearer the time to my test also beneficial. I would like to thank Ignition for making my driving experience pleasurable and the fantastic service offered by the driving school and Paul Gowlett. I was slightly apprehensive before as I had no previous experience of driving. My instructor was extremely helpful, pleasant and friendly. I don't think anything could have been done better. I would recommend Ignition to other people. Despite initial nerves, I quickly started to enjoy my driving lessons with Ignition. Colin is everything a good driving instructor should be: calm, patient, professional and with a good sense of humour! He was also skilled at explaining things in different ways until the ideas finally clicked in my mind. I'm delighted to have passed my test...Thank you Colin and Ignition. I have thoroughly enjoyed learning with Steve, his calm and relaxed approach allowed me to learn in a perfect driving atmosphere, and his experience at getting a student ready for their test paid off! My driving licence was revoked and had to re-apply for a new driving licence. I wanted to take a few classes to get me on the road after a gap of 3.5 years. Steve saw my requirement and suggested exactly the amount of hours I required to get prepared for my practical test. I had taken lessons from 2 more driving schools in Swindon but they were nowhere close to the quality of lessons given from Ignition Driving School. I am very happy that I passed within the first attempt and I will always recommend IDS to all my friends / relatives. My instructor was v.patient and encouraging. He was also sensitive to the fact I was nervous. He was always relaxed, good company and tailored the lessons to match my mood, level of confidence and experience. Dennis was a fantastic instructor, he put me at ease from the first lesson. Ignition were easy to deal with, all my questions were answered and I found the whole experience very enjoyable. I plan to take the Pass Plus with Ignition in the Summer. When I first started driving lessons with Ignition I had two previous instructors of which one of them had a different job, so was not flexible. Mark has been available at weekends, he fitted in with my needs rather than what he would have wanted to do. Prices were great. Recommend to anyone starting to drive. Excellent service, hope to complete pass plus soon. I enjoyed the course. The instructor was very helful and kind and made me relax and comfortable. He built up my confidence with driving a manual car (as I had only ever driven an automatic car before) and I passed my test first time. I would recommend Ignition Driving School to every one who is looking for the best driving school. Throughout my time learning to drive Dennis my driving instructor was always supportive and positive and gave me the confidence I needed when learning to drive. Even on the bad lessons, which everyone has, he always remained positive and supported me in learning from my mistakes, giving me confidence to keep learning. I would highly recommend Ignition Driving School and Dennis as an instructor as I was a nervous driver and someone anxious about learning to drive. This all changed when learning and now I've passed, which I never thought I would. So a big thank you to Dennis and Ignition Driving School. After a previous terrible experience with a local driving school, I was nervous about getting behind the wheel again. However, with Dennis there was no need to be; he built my confidence back up and did everything the previous driving school hadn't. He's punctual, honest and builds lesson upon lesson, taking a nervous learner to a confident driver. Thanks to him I passed my test first time. When I started my driving lessons I was very apprehensive but Kelly made me feel a little more relaxed. I found my Ignition instructor Kelly very helpful, friendly and pleasant, and she was also flexible regarding lesson times and where she picked me up. There was not anything I think that my instructor could have done differently, I think they are an excellent driving school and the tuition was brilliant. I would definitely recommend Ignition Driving School to anyone learning to drive. Steve was a legend, even though I am a nervous person, he always kept me calm. I truly rate Steve to the highest quality! I think without Steve I wouldnt have passed my driving test first time. Colin was very supportive and helpful, he helped me to relax about the test. A huge thank you to Paul for teaching me drive and giving me the experience I needed which enabled me to pass my test! I was very grateful that he was able to fit my needs as myself and my husband work opposite shifts which continually change and take it in turns to look after our daughter. Paul was very flexible when it came to arranging lessons, arranging them at short notice, of various lengths and ending at either my home or workplace depending or where I needed to be. He knew I wanted to pass my driving test by October (my 2nd child is due on the 19th of October), although I wasn't sure that this was achievable, but he remembered and I did it! - A great relief & very useful. He was always calm and friendly and explained things well. He showed me different ways of doing things (e.g. different steering methods when parallel parking). Paul also encouraged me to push me too far (e.g. I hated reversing into a bay from the right, he got me to do this a few times until I felt comfortable with it, but didn't overdo it or require perfection with it). I will definitely recommend Ignition Driving School when I hear of anyone wishing to learn to drive or change instructor! Thank you again. My experience with Ignition was Brilliant! Although I was unable to book my lessons in as short a space of time as I wanted, Steve was a Brilliant instructor, made me feel relaxed and instilled the confidence I needed to pass. Would definitely recommend Ignition / Steve to anyone I know wanting lessons. I recently passed my test first time with only one minor thanks to Dennis. I found all the lessons we had were productive. I had previously had lessons with another driving school so I knew the bascis, however I felt in my first lesson with Dennis I had learnt/done more than in previous three lessons with another instructor. Dennis was very patient and easy to get along with, I would recommend Dennis to any one and am going to do my pass plus with him. Having had two driving instructors before Kelly, I can honestly say that she is a reliable, friendly and patient person to assist you in your driving lessons. Before I chose Kelly, my confidence in driving was low. I never felt that I could drive on my own, but with Kelly's tuition I have now passed my test and am enjoying my driving even more. Kelly is always willing to change lessons around if you need a lesson at a certain time or day and always turns up on time. I enjoyed learning with Kelly because although she teaches you how to drive, she makes you feel so relaxed and it gives your confidence such a boost. 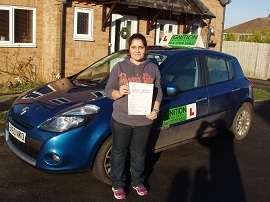 I would like to thank Sandra 'ignition' for all her support and help and the training she gave me for my driving lessons. She is a wonderful trainer and the best one I had. I have recommended lots of my friends and family members to Ignition Driving School. Once again I would like to thank 'Ignition Driving School' and Sandra for all their hard work and training me to acheieve my goal to become a good driver. Brilliant driving school and friendly instructor who made me feel relaxed and comfortable when driving. I would definitey recommend. I was very nervous about learning to drive, but when I met Kelly I was relaxed straight away. She was a really nice lady & very friendly. I canÂ´t believe the patience she had! I wouldnÂ´t change anything about the whole driving experience. I have already recommended a few people to use Ignition. Thank you very much for getting me through my test! I hope me and Kelly can stay in touch. When I started with Ignition I had very little driving experience. My instructor, Mark, was very patient, informative and easy to get along with. He made the whole experience enjoyable. Thanks to Mark I passed first time, with only 3 minors. My instructor was patient and encoraging at all times. He kept me going even when I felt like giving in. I would recommend him whole heartedly. As a novice learner starting from scratch, I am delighted to have passed my driving test at first attempt with only 2 minors. I achieved this in 30 lessons with Paul GOWLETT who has been an incredible tutor: patient, reasonable, very flexible to my time constraints, and thorough. I can now drive safely and with great confidence. Within days, I have begun taking my children to school and various events without being anxious. I have no hesitation in recommending Paul Gowlett for drivers in the South Warwickshire area. Good Luck! An excellent driving instructor and a pleasure to learn with. He is patient, explains everything to you in detail, Steve is friendly and patient, he will not rip you off and tell you that you need more lessons when you don't, as do some instructors I have been with in the past. I would recommend him to everyone, he is already teaching my brother to drive, and his prices are good. Thank you for a fantastic driving experience. I really enjoyed my driving lessons. Paul was very welcoming and patient, whilst I got the hang of all the manoeuvres. The car was nice to drive, and the booking hours very flexible. I have not just learned to pass my driving test, but to be a safe and cautious driver, picking up useful life skills I can use for the rest of my life. Thanks for all your help, I enjoyed driving thoroughly and am so pleased I passed my test. I wasn't apprehensive about starting my driving lessons. However, even if I had been I have no doubt that Kelly would have done all she could to put me at my ease. She was always pleasant and helpful - I couldn't have wished for a nicer person to teach me! It was particularly useful being able to text at short notice - the flexibility was very helpful. I have already recommended Ignition to two friends and no doubt I will continue to do so in the future. Thank you Kelly for all your guidance and support! Paul was a fantastic instructor - very supportive, clear and flexible when fitting lessons in around my lectures. I would have no hesitation in recommending Ignition and Paul - thank you! Dennis was a very reliable, punctual and accommodating instructor and I would definitely recommend him to any new driver. 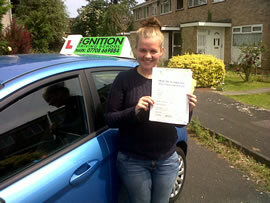 Sandra was a brilliant instructor, I would highly recommend her to anyone wishing to learn to drive with Ignition. Her directions and information during my driving lessons were clear and helpful. Her feedback was useful during each lesson. I passed my practical test first time. Thank you for all your help. Learning to drive with Paul was a great experience, he was very helpful and was always on the end of the phone if I had any questions or doubts. Passed first time after only 13 lessons and 3 months and 10 days after turning 17! Nothing else to add... Andy, my instructor was brilliant. Paul Gowlett is a very patient and reassuring instructor who made sure I was fully prepared for my driving test first time and having passed I now feel I am a confident driver and have progressed massively from where I began. I met with Paul in March, having had no driving experience whatsoever! He said to me the first time I spoke to him "I am not teaching you to drive to pass a test, I am teaching you to drive safely for the rest of your life" and this is exactly what he has done. I had two 6 week gaps in the 9 months I was learning, and still passed first time, a lot of which I put down to Paul and what a brilliant teacher he is, and he is such a nice guy as well. He made the whole experience an enjoyable and memorable one. He taught me the clutch control on a hill and talks about the victoria sponge and the jam and how you have to be more into the jam when you're on a hill (meaning lift your clutch a little higher, anyone taught by Paul will know what I mean). I am already recommending Paul to anyone I know, and even considering motorway lessons. Once again, Paul, You're great, thanks so much for being so patient, you're a star! During my lessons, it was an enjoyable experience. I learned new things every lesson. My instructor (Steve Perry) made me feel comfortable and at ease. He had total faith in my ability even when I doubted myself. Overall it was a great experience and I would recommend Steve to any of my friends who wish to take driving lessons in the future. Paul is an excellent driving instructor. His instructions were very clear and he is also very understanding and patient. Having being very disappointed with my first instructor (from another company) I was very pleased that I was able to progress much faster with Paul's instructions. I have recommended Paul to all my friends. It has been a pleasure to start my driving lessons with Ignition Driving School after having to give up hope of ever passing the test with another driving school as it just wasn't coping up with my style. Rather than making me feel at ease behind the wheel, they were trying to make me change my driving style so that it added another couple of paid hours for them and more misery for me. With over 6 years of driving experience over some of the craziest roads in the world, I found it ridiculous and had to walk away from them, even thought there were a few hours of paid lessons leftover. Starting my lessons back at Ignition I simply felt great behind the wheel, as I now had an instructor who was happy to observe my driving style and make suggestions so that it was aligned with the requirements of the DSA. The patience shown by the instructor is definitely worth mentioning as it brought back my confidence on passing the test and driving was fun again. The timings were adjusted to suit my requirements and the mock tests massively improved my chance of passing the practical test. After 20 hours of lessons and two tests later I am the proud owner of a full UK driver's licence. Today when I have to drive 120 miles a day to my work place, I feel so much at ease. Thanks to Ignition for making my driving experience a happy one, for today and for many more years to come. Paul was brilliant. I lacked confidence, due to my first instructor with a different driving school, but Paul quickly put me at ease and got me through my test first time. I was very pleased with Paul and will be happy to recommend him. Milly was a really wonderful teacher! Excellent teaching methods and gave me such confidence in my lessons. Thank you so much, I will miss the lessons! Passed with flying colours and it really was down to Milly. I definitely have the skills for life not just the test! I had a test booked and at short notice Ignition were able to accommodate. I joined Ignition and Mr Steve Perry was my instructor. He was very friendly, professional, very informative and his teaching technique was ultimate. I started enjoying it from day 1. I passed my test with minimum classes. Today I am a confident driver. Thanks Steve. Learning with Ignition was a fun experience, and I feel that throughout the course I was guided well on what to do and how to do it. I would definitely recommend the company to anyone. After trying with another local driving school, who I found the instructor difficult to understand and didn't feel at ease, someone recommended Steve Lightfoot at Ignition Driving School. With Steve it was a totally different experience. Steve was friendly and supportive from the word go, which made me more confident with each lesson. Thoroughly recommend him. Paul was my instructor. I found Paul very helpful and professional. He helped ease me into driving as I was very nervous. 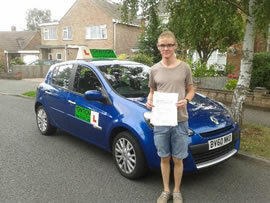 I then passed with no minors and wouldnÂ´t have been able to do it without PaulÂ´s help and support. Paul was recommended to me by a friend and I will definitely be recommending him to everyone I know. I was quite apprehensive before starting my lessons but after my 1st lesson, I felt very confident. I have to say Steve is the best driving instructor ever! He was always helpful, pleasant, friendly and very funny! He taught me so much in such little time and gave me the confidence and push I needed. I would definitely recommend Ignition to anyone. Thanks for everything Steve. I am definitely happy that I chose Ignition Driving School. Paul is a pleasant person who has been of great help throughout my driving lessons. His instructions are clear, simple and straightforward. He never makes things complicated for the student as he has an excellent skill of observation that enables him to focus on the student's points of weakness in driving. I'd recommend Paul to any student wishing to learn as well as enjoying driving. I really enjoyed learning with Ignition, the instructors are helpful and friendly. My instructor always explained any errors but never criticised my driving helping me pass first time. I wouldn't have chosen any other driving school. I began learning to drive with Steve the day after my 17th birthday and after my first hour I was already able to drive confidently. Steve is a friendly instructor who I was able to build a good rapport with and after only 15 hours of lessons I was able to pss my test first time and drive with confidence. I took many lessons with Jim Hosking - who was just fantastic as an instructor. I was very apprehensive, and he managed to put me completely at ease during lessons now that I have passed my test I can say I will miss my lessons with Jim! The timing of lessons was very flexible and always fitted in with my work and family life. I have recommended Ignition Driving School to many friends and colleagues. I loved learning to drive with Ignition Driving School! Sandra was really helpful with everything, and persevered with all the things I did wrong, and countless silly mistakes I made. The picture cards showing examples of situations were really useful, especially when learning the manoeuvres, which made it really easy. The experience was fun too, I looked forwards to every lesson with Sandra. Sandra was friendly and helpful. I liked the way she was arranging time for me with her availability with other pupils. I also liked the car, it was perfect car for a learner. Many thanks to Sandra and her patience. Steve was a brilliant instructor and explained everything clearly. Because of him I passed with 2 minors. Steve was friendly, polite and always on time for lessons. I wish him all the best. I had previously had lessons with another driving school and failed my driving test. I only had a short time (3 weeks) until my driving test retake and was worried about passing my test. My instructor (Dennis) was fantastic and helped me feel more confident about my driving ability. I passed my test the second time thanks to Ignition. After 5 months learning to drive with another driving school in 2006, I quit and lost my confidence. Then after passing my theory test in April this year, I decided to give it another go again. I made the correct choice in choosing Ignition, and I gained my confidence back straight away. My instructor Paul was fantastic! He couldn't have been any better. He was so friendly, helpful and most of all - patient! He showed and explained everything to me in such a clear and understanding way. I would definitely recommend Ignition to other people and would like to say thank you to Paul for his help and guidance over the past 5 months! Paul was a very good driving instructor and always gave useful feedback during lessons. He was very helpful to start the lesson with a recap of what happened last lesson and what areas I needed to work on (e.g getting into the right gear at roundabouts early). Paul was always on time and gave a full hour every time. I am very happy with my choice to learn with Ignition Driving School. My instructor Paul was very helpful and got to know me very quickly. I thought this was good because he knew how to get the best out of me. I will definitely recommend Ignition to people if they were looking to learn. I thoroughly enjoyed my lessons with Ignition. My instructor, Steve, was friendly, patient and supportive throughout, and I passed my test at the first attempt, after fewer hours than I thought I would need. Thank you!